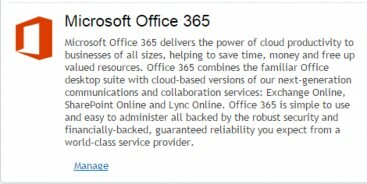 This guide will help the administrator manage their 365 subscription via the Cobweb control panel. Synchronise now button will allow you to sync any new changes you have made within the 365 portal itself or via control panel. Please note: Password resets will not be synchronised between 365 and your control panel. Fill out the fields as below making sure the usage location is set to UK. 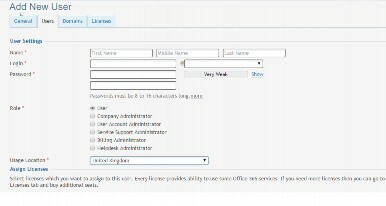 Now assign the user a licence from your bank of available licences by ticking the box beside the available licence and click Add. This section will display domains that you have added to 365 and will give you the ability to add more if required. You will now see the domain has been added to the 365 service. This shows what 365 subscription you have purchased, and what licences you have used and what are available.